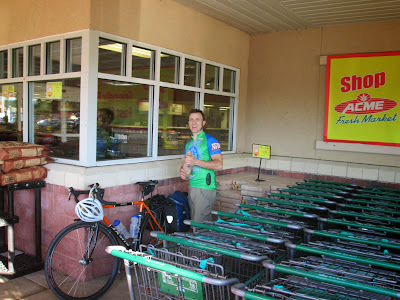 This past Sunday evening, I (Kevin) was joined by two of my colleagues from here in the Century Cycles store in Peninsula (Austin and Chris) for our latest Sub 24-Hour Overnight, or S24O. 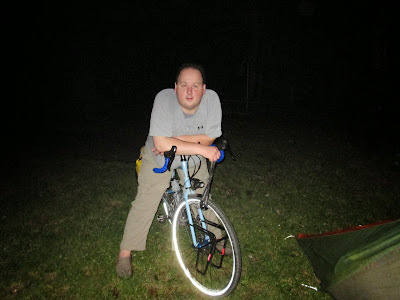 An S24O is a single overnight bicycle trip. 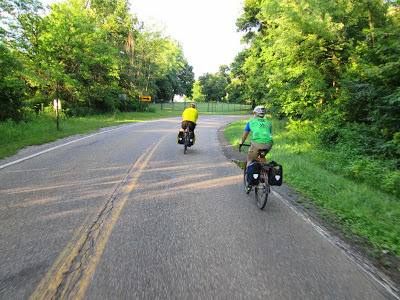 If you're thinking about getting into long-distance self-supported bike touring, an S24O is a great way to try it out and see how you like it. It's also a good idea to test out your bike-touring gear, camping and cooking skills, and experiment with what kinds of foods you might like to carry. 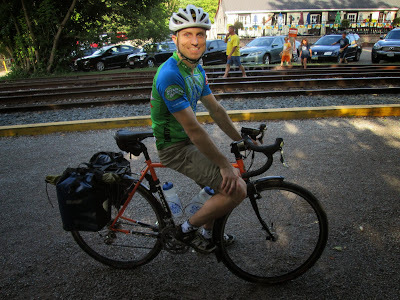 The benefits of the racks and panniers are that it's easy to organize, pack, and access your stuff, and you have plenty of room to bring along everything but the kitchen sink. 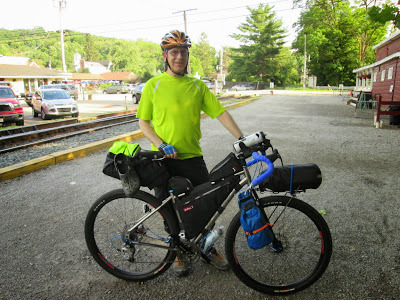 Notice how instead of racks and panniers, I'm using the frame bag, large seat bag, and the dry sacks strapped to my fork using Salsa Anything Cages. Yes, I do have a rack on the front, but it's called the Salsa Minimalist Rack. It doesn't support panniers; you just have to strap another bag on top of it. The main benefit of this setup is lighter weight, but you have to pack much more carefully and minimally, and it's a bit more of a hassle to pack, un-pack, and re-pack your stuff. 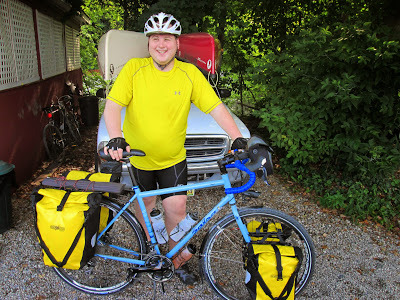 He's using the "whatever works" method of packing, with just a rear rack and panniers. 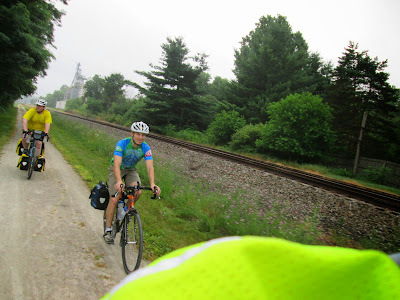 Just down the road, we got to Towner's Woods Park, where we hopped on the Portage Hike & Bike Trail, and followed that into downtown Ravenna, then followed Route 59 and Route 5 to West Branch State Park. We arrived at our campsite around 9:30pm. 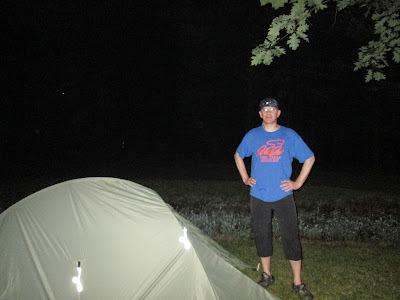 After pitching our tents, we prepared our dinners, and enjoyed the cool evening's full super-moon. Chris and I fired up our stoves, while Austin had food that didn't require cooking, which explains how he was able to pack so light! We ended up turning in a little after midnight. 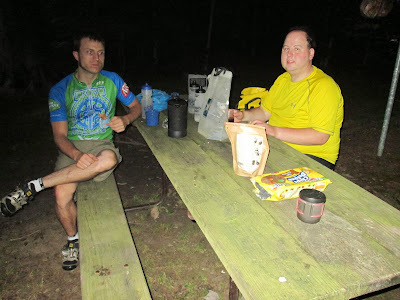 We woke up at 5:30am and fueled up for the ride home with coffee and cookies. Our route home was the reverse of our ride out the night before. We arrived at Perkins in Hudson around 8:20am for a full breakfast, and arrived back in Peninsula in plenty of time to re-open the store! 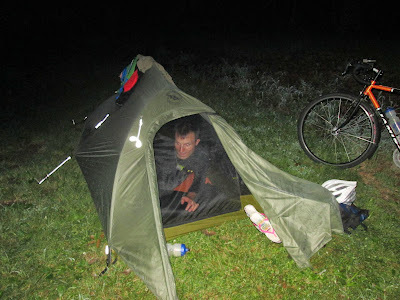 Think you can't handle an overnight bike trip? Read about how a woman in Minneapolis did it with her 10-year-old niece, and wrote about it in this article for the Star-Tribune newspaper. We previously wrote about the Sub 24-Hour Overnight concept in this article from five years ago in Ohio Sports & Fitness Magazine. 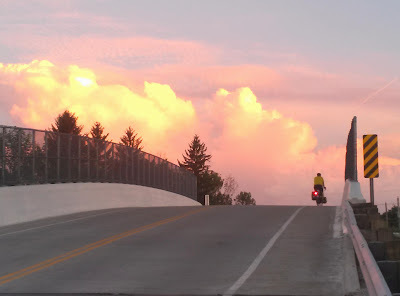 It's got more suggestions for destinations and ways to enjoy your bike trip. Not into camping? You can pack even lighter and stay at a motel or B&B!